I’ve been into robotics for about a year now. My first project was a kit that I picked up at RadioShack. It was an Arduino car kit which I modified to be an autonomous vehicle using an ultrasonic sensor. Something about coding a machine to move in the real world excited me and I have been on a quest to learn as much as I can about it. I wanted to make Newton better so I added some movement to his neck. I used a servo for panning movements. Now Newton could look left and right. This made him even better at moving around autonomously. After completing Mark II I realized that the chassis I was working on was too limited to move much further. So, the next version of Newton was an extreme upgrade. I got a 6 wheel drive high-torque chassis that required a LiPo battery. I got a Lidar-Lite for the autonomous navigation, Arduino Mega so I had lots of GPIO pins, GPS breakout so he could know his location, and an LCD so I could print GPS coordinates and see where he was in the code loop. After Mohawk I realized that I needed more processing power. The single-threading of Arduino was great but not enough for me to do much more. Somehow I ended up getting into computer vision. I created ALFRID Mark I which was a robot that would look for and follow faces around. 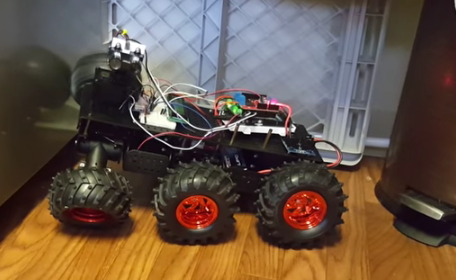 It used 2 servos, an Intel Edison, and an Arudino Uno. This was a pretty cool project which I entered into a hackathon and won a prize with. ALFRID took a totally different turn in Mark II. He become a voice assistant and home automation tool. Now Alfrid could answer questions and turn on things in your home. Alfrid got upgraded with his own custom body in Mark III. This body was 3D-Printed and included his speaker, mic, and computer all-in-one. He also had a new surf and weather forecast alarm and voice biometric security system implemented. There are more videos of ALFRID on my YouTube channel. Now, I am working on more computer vision projects. If you want to follow my work subscribe to my blog.